I’m already 5’9” tall and don’t really need any extra height, so I like a super flat sandal. This Bally pair fit the bill. The toe shape was perfect, and flattering, and the leather straps were soft and wouldn’t rub.But what is with all of those straps? Perhaps I missed the point of the original design, but…. I couldn’t figure out how the hardware for the closure was supposed to work. 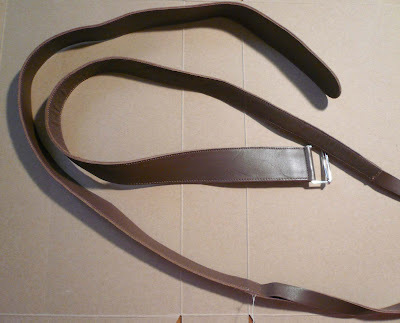 And why did the width of the straps suddenly get wider at the top? Strange... To make matters worse, the straps themselves were coming apart, and the strengthening tape that gives the straps some strength was fraying. Not so pretty. So, I cut the straps shorter, just below the strange additional part just above the stitch line. 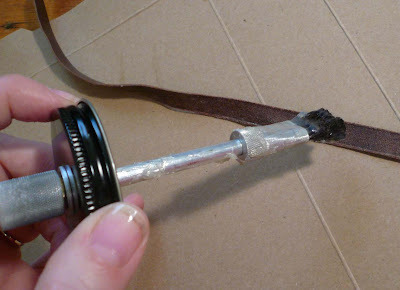 Then, because I happen to know that the white, fraying strengthening tape is much more necessary for the straps that go across your foot, and not so necessary that straps that wrap around your ankle, I decided to cut it out, where it was starting to separate and start to fray. 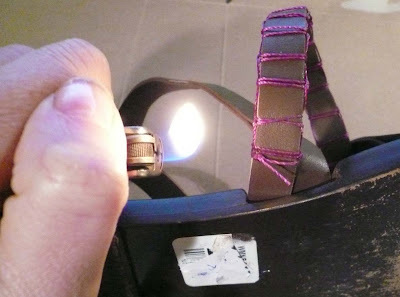 Then I used Barge Cement to glue the tape-less straps back together. Barge works just like the rubber cement you’ve used in the past- put a thin layer on both of the two things that you want to stick together. Let those layers dry, and then join. At this point, I had already improved the sandals enough to wear them out in public without being stared at strangely:But I thought I could do a little bit better- jazz these babies up a bit. Inspired by some of Kat’s previous projects, I pushed forward. But I’m a minimalist at heart. Studs and hardware are not really my thing. How could I add a bit of detail to these guys, and still create a pair of shoes I’d want to wear? I started to doubt my worthiness of being a We Can Re-Do It guest blogger! I was starting to think about throwing in the towel. Then I thought of the jewelry that I’ve been making and selling on Etsy. I imagined a slight adornment, based on decorative stitch that I’d used to make necklaces & bracelets. But I didn’t want to over do it. I wanted to keep the sleek minimal look that first attracted me to the sandals in the first place. So, I pared it down:I used a bonded nylon string to make a stitch along two of the four straps covering each foot. The stitch that I used is the exact same one that you used in middle school in order to make friendship bracelets. 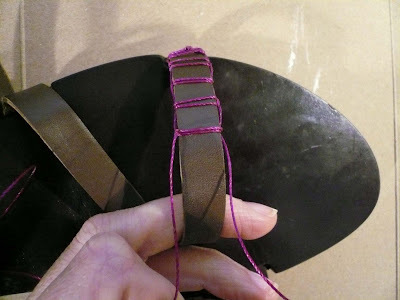 Two knots are made on each side of the strap with the purple nylon string, alternating sides, in order to make a ladder shape. Now, the only thing left to do was to neaten up the end of the straps that would wind around my ankles, and tie into a neat knot. 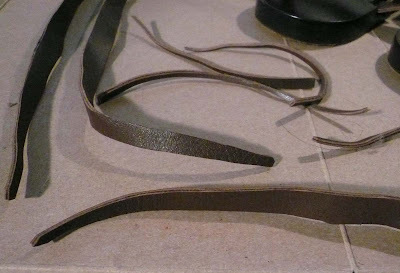 Rather than leaving the straps cut raw at a 90 degree angle, I thought that the knotted straps would be more secure if I tapered the straps at their ends. 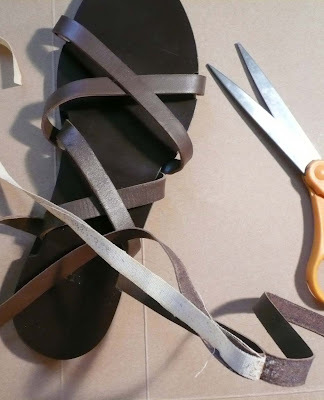 You can see in the photo that excess that I removed from both sides of the straps, in order to create a thinner, tapered end to each strap: Straps fixed, and (not too much) adornment applied, I am totally ready to wear my new sandals! The improvements here are subtle, but I’m really happy with the results. I’ve taken a pair of strange and somewhat useless sandals and given them new life. As it turns out, even a doubter like me really can Re-Do It! Great post, interesting blog! We could even redo the story at toemail. Thanks so much, toemail! You're more than welcome to link to it. Cool! What's your general location? Loving your blog, this is super exciting!